Habitat : Grown in southern-india, particularly in tamil nadu. Uses : It is aromatic, carminative, digestive, anti-inflammatory, diuretic, lactagogue, , hypnotic, hallucinogenic, antispasmodic and stimulant agent. Helps relieving flatulency, useful in nausea, stomachache, vomiting, diarrhea associated with cholera. Also useful in diseases of the liver, spleen, headaches, palsy and eye troubles. 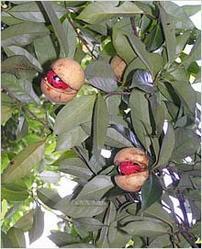 Nutmeg is used as spice, in bakery and confectionery items. Nutmeg oil stimulates the heart and circulation, activates the mind and revives people from fainting spells. The oil has good anti-inflammatory action, and is also successful in relieving pain, especially muscular aches and pain, as well as rheumatism.